Rock star poets will be sharing their unique interpretations of New Street in front of the homes that are part of this Inglewood lane's eclectic charm. Meeting in front of neighbourhood landmark St. Vincent's Church, everyone will be led to secret locations along New Street for a fully engaging poetic experience. Featuring readings by Poet Laureate Kris Demeanor, Aaron Giovannone, Caitlynn Cummings, Rosemary Griebel. The event will conclude with a concert in Nellie Breen Park by the New Street Band, who will perform their hearty and inclusive music in the gazebo. Jelly Modern Donuts and JoJo's BBQ food trucks will be out for some seriously delicious donuts and BBQ. Tickets are limited! Get yours now, there are only a few days left! This event will be curated Tickets are $10 and available at Reworks, Double Elle Bakery, Gravity, and Zyn. by Roberta McDonald. Or, contact us here to order your tickets. Calgary born songwriter Kris Demeanor delights in exposing the underbelly of western Canadian culture- gambling, drug use, murder, religion, the suburbs. His numerous CDs of original work explore the darkness and absurdity of these corners of Alberta life. With the Crack Band, he draws on dense spoken word, folk, and shamelessly hooky pop for audiences who like to laugh, dance, think and weep all at the same time. While Kris's music has taken him around the world performing, Kris has also become a fixture of Calgary's spoken word, literary and theatre worlds, creating music and lyrics for numerous award winning projects. Career highlights include taking the award winning short film based on his song "I Have Seen the Future" to the Sundance and Toronto film festivals, collaborating with the Calgary Philharmonic Orchestra on the 2011 event "Acres of Dreams", and sharing a beer with David Byrne. Caitlynn Cummings has an MSc in Creative Writing from the University of Edinburgh and writes poetry, fiction, and drama. She is also the Managing Editor of the Calgary literary magazine Filling Station. Her work can be found in the Scottish magazine Drey (Red Squirrel Press), Two in the Bush (Blurb), Migratory Words Vol. 4, and everywhere else you least expect it. Aaron Giovannone is a poet mostly. He is also a translator of poetry from Italian. Originally from St. Catharines ON he now studies at the University of Calgary and works a little at ACAD. He likes living in Sunnyside where the train is close and so are his friends. He also likes being alone but not too much. As he wrote the biographical note for this reading, he wondered about the use of the 3rd person and if the "self reflexive thing" was too cute. Rosemary Griebel's award-winning poetry has appeared in "The Best Canadian Poetry in English" on CBC Radio, literary magazines, anthologies, chapbooks and on public buses. Her long awaited collection of poetry, "Yes. ", was published by Frontenac House in 2011, and was short-listed for two national awards and one provincial award. She lives in Inglewood with her husband and two cats and is currently working on a project to build a bold, new Central Library in Calgary's East Village. musical genres ranging from funk and roots to disco. Clarinet, melodica, harmonica, banjo, guitar and bass accentuate three part harmonies to create a sound that appeals to a diverse audience. 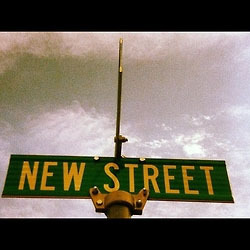 New Street has enjoyed playing Calgary pubs, benefit concerts, the South Country Fair and is an Inglewood house party favourite. In case you haven't been to this (rather secret) little street, here is a map where you can see New Street, as well as Nellie Breen park.